Based out of the Yellowknife research office, Jennifer Hickman supports researchers studying the impact of environmental changes and resource development on water quality in the NWT. 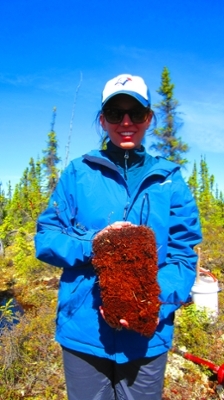 Hickman completed her MSc at Wilfrid Laurier University with Michael English, professor of Geography and Environmental Studies, studying subarctic peatland hydrology and carbon quality. Her primary research focus was understanding the hydrological evolution of subarctic peat plateaus over time as discontinuous permafrost thaws, as well as how these changes may influence the quality and movement of dissolved organic carbon from terrestrial to aquatic ecosystems.